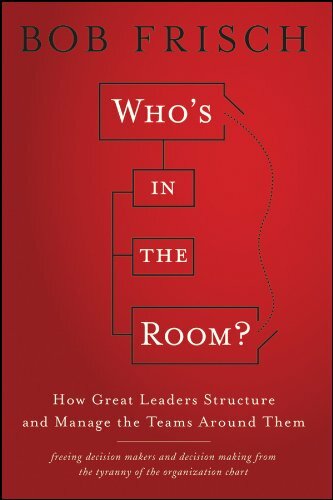 Mar 17 Things you need to know about the book " Who's In The Room by Bob Firsch"
At the top of every organization chart lies a myth — that the boss and senior management team make all the critical decisions together. In reality, most decisions are actually made by the boss and an inner circle of confidants — a “team with no name” that exists outside formal processes. This gap between the myth and reality of decision making causes significant problems. Executives wonder why they weren’t consulted earlier. Bosses wonder why team members have trouble grasping the big picture. There’s a tension in the executive suite, and repeated attempts at team building don’t seem to resolve it. In Who’s in the Room? Bob Frisch provides a unique perspective on this widely misunderstood issue. Flying in the face of decades of organizational psychology, he argues that the solution lies not in addressing behaviours, but in unseating the senior management team as the epicenter of decision-making. Using a broad portfolio of teams — large and small, permanent and temporary, formal and informal — great leaders match each decision to the appropriate team in a fluid, flexible approach that you won’t find described in management textbooks. Most of the world’s best executives make decisions in ways that don’t show up on an organization chart or a process flow diagram. When it comes to critical decisions, they implicitly understand the inherent limitations of the formal executive team. They tacitly acknowledge that it’s desirable for the boss to have the ability to vary who is in the room when major decisions are being made. And they instinctively know exactly whom they want with them in the room for each specific decision. Having a small cadre of trusted advisers in the room when each big decision is made is the way most leaders run their organizations, and when the real nature of the executive team is fully understood it will also be clear that this approach is the best way. advisers that he or she consults about most major decisions. As the executive ultimately accountable to the board, the CEO has every right to consult anyone he or she pleases in making a major decision. • It enables the CEO to consult with precisely the right mix of advisers for a particular decision. • Because it is a small, highly selective group, it preempts the problems of endless discussion, uneven qualifications and competition over turf that plague larger, more representative teams. • It frees the CEO from the organization chart, which describes reporting relationships, not decision processes or decision rights. Involving all of the CEO’s direct reports in every decision is inefficient. • It provides the CEO with the candor and the confidentiality that only a small, highly trusted group can provide and that is critical in making major decisions with far-reaching implications for the company internally and externally. These unofficial, ad hoc groups are a powerful asset, and so leaders have employed them since the dawn of recorded history. Leaders are not only unlikely to give up kitchen cabinets, they shouldn’t give them up. Ultimately, the issue is not whether the kitchen cabinet has supplanted the Senior Management Team (SMT) or usurped its role, but how best to use each team. their working lives in meetings. seen with the three naturally occurring teams — the kitchen cabinet, the SMT and the all-officers group — the size of a group makes it better at some things than others. The same principle should be applied to all teams. • Composition should be determined by the nature of the issue at each stage of the conversation. Just as teams can be flexed in size depending on the desired outcome at any given point, they can be flexed in composition, understood as the kinds of expertise different individuals bring to the conversation. • Issue ownership should be determined by the requirements of the conversation, not by a charter. There is no iron rule that says a particular team has to handle an issue from beginning to end. Different points in the conversation may require the participation of different teams. The company’s current situation determines how the SMT combines or sequences three questions about an initiative: (1) Does this team own it? (2) How important is it relative to the others? (3) How urgent is it relative to the others? The company may already have prioritized by importance but now needs to decide on timing. Or, facing a crippling proliferation of initiatives, it may need to tame issues of both timing and importance right away. rank ordering. Absolutely and precisely rank ordering initiatives is virtually impossible. • The secret lies in fuzzy logic. The reasoning behind bucketing initiatives this way is roughly analogous to applying fuzzy logic — an idea that first appeared in mathematics for situations in which the reasoning is approximate. Rather than an attempt at false precision, the fuzzy logic of the initiatives prioritization conversation is a series of pairwise comparisons. whether a given initiative is more or less critical than another if it’s a question of clustering it in group A or group B. The grouping of initiatives proceeds on the basis of approximations, with neither absolute values for inclusion in a particular group nor absolute ranks for the initiatives within a group. do/should do/nice to do or now/soon/later, is much easier and just as effective as spending hours negotiating precise outcomes. made by the time they get to the senior team, having been all but decided by the accountable executive, with critical sign-offs acquired along the way. Yet the near-universal use of the SMT for final review and some form of sign-off on business cases goes unchallenged and unchanged. being presented to the senior team or to a single executive, they have a glaring weakness: They are written and put forward by people who want the answer to be yes. frame a business case in terms of one function, yet in most companies the process remains primarily in the realm of financial data on spreadsheets rather than in a real discussion of do-ability. resources not already absorbed by business as usual may already have been allocated to other initiatives. The proposals that get the lion’s share of funding are not necessarily optimized around the best cases but rather those that come at fortunate times in the approval cycle. • Set the strategic dimension of the business case in the context of the team members’ conversations about their common view of the world and the company, and their prioritization of initiatives. • Set the business case in the context of the cases that have been previously approved and those that are likely to arise in the future. • Create templates that require answers to the fundamental questions of do-ability, including critical resource dependencies as well as risk assumptions. • Use the final SMT review meeting to probe those dependencies and assumptions — with each member representing his or her function rather than the team acting as a single executive entity. • Gain commitments from each team member to deliver the critical resources identified, with the team understanding the trade-offs involved and potential downstream implications. • Recast ownership of initiatives arising from strategically important business cases to the SMT as a whole, with both individual and collective responsibilities and consequences, instead of viewing the sponsoring function as the sole owner of the initiative going forward. 1. Teams don’t decide — executives do. Teams can provide valuable input, insights and ideas — they are a critical element of management. Their discussions can surface solutions and provide persuasive points of view. But it’s rare that a major decision is actually put in the hands of a team. True group decision-making is a rare event in practice because groups don’t have accountability. Individuals do. decisions and processes. Dispelling the myth of the SMT members as the gods on Olympus and recasting them as a unique instance of an ordinary organizational construct — an executive’s staff — can be a more powerful transformative tool than years of organizational coaching and team building. critical decisions must be made, leaders want and need the counsel of trusted advisers. They may form a small core group that gets together regularly, occasionally joined by one or two others, or a leader may choose to get opinions from others one by one. But it’s rarely, if ever, the Senior Management Team’s meeting as a full group that fulfills this crucial sounding-board function for a CEO. real influence than ever over the course of the business and will re-energize them.